Halifax’s uneasy relationship with the Titanic 100 industry. 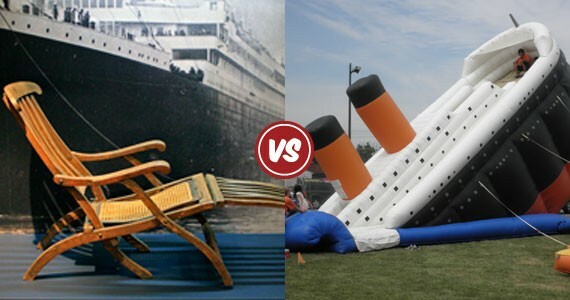 The tragedy and the toy: A rare Titanic deck chair at the Maritime Museum of the Atlantic, and a not-rare-enough bouncy castle. Pigeon Forge is a small town in Tennessee, close to Great Smoky Mountains National Park. Savvy development has helped the town become a full-blown tourist mecca, offering a range of diversions from the Dolly Parton-themed amusement park Dollywood, to indoor skydiving, to shopping in umpteen outlet stores. Pigeon Forge is the sort of place people go because people go there. And such is the state of the Titanic tourism industry that this land-locked burg with no connection to the disaster can become a star. The Titanic Museum Attraction bills itself as the "world's largest" permanent exhibition devoted to the doomed ocean liner. John Joslyn says he founded the museum, in a building that looks like the Titanic, as an expression of his "magnificent obsession" with the ship. 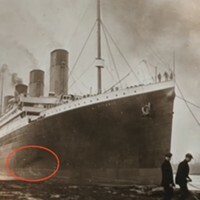 That obsession started taking shape in 1987, when Joslyn---a TV producer who'd just made The Mystery of Al Capone's Vaults---was part of a mission to explore the Titanic's wreckage for the show Return to Titanic...Live. Nearly 20 years later he opened his first Museum Attraction, in the tourist town of Branson, Missouri. The Pigeon Forge branch launched in 2010, the location chosen for its commercial potential as "one of the fastest growing tourist destinations in America, attracting more than 11 million visitors every year," explains the museum's website. Joslyn seems to be a modern-day mixture of Jules Verne and PT Barnum. Museum visitors receive a "boarding pass" on arrival with the name of an actual Titanic passenger or crew member. Things to see inside include the replica Grand Staircase, a wall of frozen water to let guests "touch a real iceberg," a videogame simulation where people can try to steer the Titanic off its collision course with destiny and the Discovery Room, with images from Joslyn's expedition to the wreck site. At the end of the tour is the Memorial Room, where each visitor discovers if "their" passenger from the boarding pass survived the sinking or not. In this way, the tragedy is made real. The inevitable museum shop sells all manner of tchotchkes. To honour the centennial of the April 15, 1912 sinking, the museum created a 1st Class Maid 100th Anniversary Edition Doll, a limited-edition that comes with a certificate of authenticity. In this way, the tragedy is made into a $14.99 plush toy. The Titanic Museum Attraction is successful. It received 800,000 visitors in its first year, among them a few Haligonians I know. Smiling in pictures taken beside the steering wheel on the museum's replica ship's bridge, they came back from the Tennessee hills infused with Titanic spirit. It should, of course, be the other way around. The accident that made the Titanic a legend happened to bind Halifax to the ship in a supporting role. Survivor Hilda Slayter's house, victim George Wright's house, the sites and artifacts connected to the recovery efforts---the streets of Halifax are a giant Titanic tour. The Maritime Museum of the Atlantic has one of the boat's only known deck chairs on display in its permanent Titanic exhibit, but its annual attendance of about 150,000 pales beside the Pigeon Forge museum. The centennial is sure to bring with it more visitors for both museums. But the Titanniversary and its accompanying tidal wave of product---including books, events, event TV, collectible dolls and, most disturbing of all, commemorative cruises---is only the latest surge in Titanic popularity. There were also spikes when James Cameron's movie came out, when Robert Ballard found the wreck in 1985, when Walter Lord's A Night to Remember book was published in 1955. Meanwhile in between, interest never died out. The Onion's headline perfectly captures Titanic's enduring appeal: "World's largest metaphor hits ice-berg." The truth has all the ingredients for a great tale: romance, irony, hubris, celebrities and action sequences. Titanic makes for such a perfect story that people forget it isn't just a story. 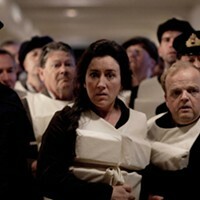 That's why Entertainment Tonight called the Costa Concordia's crash a "real-life Titanic" earlier this year. It also explains how sinking-Titanic bouncy castles became a thing, rather than a hate crime. But Halifax's relationship with the story is rooted in the reality of corpses and mourning. It's further complicated by a trick of historical perspective. Many see the sinking as marking a page turning---it signals the end of the Jazz Age or of England's class system. For Halifax, however, the disaster started a new chapter. During the Titanic century, Halifax has been the Forrest Gump of history's biggest traffic accidents, a helpful bystander to events beyond our control. Titanic, the Halifax Explosion, September 11---we remain vigilant in case the list grows longer tomorrow. Halifax even reprised its real-life Titanic supporting role for Cameron's Titanic when it shot here. 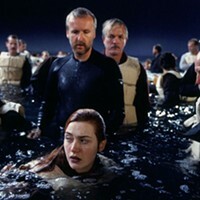 The production brought several prop Heart of the Ocean necklaces to town, but for various reasons they didn't look right when filmed, so Barrington Street jeweller GF Roberts was commissioned to rebuild them and save the movie. And whose doctors do you think they turned to when crewmembers were poisoned by angel dust-laced chowder at the wrap party? A new museum opened last month in Belfast, Ireland, billing itself the "world's largest Titanic visitor attraction." It has no relationship to the Pigeon Forge museum, but impeccable Titanic connections: It is located on the site of the Harland and Wolff shipyard where the boat was designed, built and launched. Titanic Belfast's creation story, as told in countless press reports, involves a city so desperate to untangle itself from Ireland's sinking economy, that it was willing to lay bare one of the biggest blemishes in its history. The museum building is designed to be a significant modern landmark, with jutting angles evocative of ships' hulls the way Sydney's opera house suggests sails. Exhibits don't shy away from the disaster---even giving credit to Halifax for its job as Titanic's undertaker---but the museum also celebrates Belfast's shipbuilding heritage. This stuff is awesome, not tragic, so massive that visitors ride a roller coaster to appreciate the scale. Opening in time for the April 15, 2012 anniversary was no accident. At the end of March, the museum had already sold over 100,000 advance tickets, and this weekend's centennial activities are sold out. As a Belfast Titanic expert has been quoted, "tragedy plus time equals tourism." That equation doesn't exactly carry over in Halifax's case. Tragedy plus time plus a graveyard still equals a graveyard, and only Egypt has made that work as the anchor of a tourism economy. Halifax has 150 Titanic victims buried in three cemeteries. The rows of headstones at Fairview Lawn---the world's largest Titanic gravesite---are not majestic and alien like Egyptian pyramids. They are human and real and sad. A fitting reminder of the Titanic, just not the sort of thing to inspire roller coasters or collectible dolls. 2017 off to a hot start for fans of big boats and conspiracies. Titanic fever is sweeping some select tables in Halifax this week. 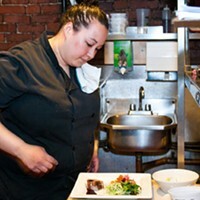 we take a look at two Titanic-themed meals at The Press Gang and Brooklyn Warehouse. People groaned when James Cameron’s Titanic was rereleased in 3D, but Coast film critic Matt Semansky longs to take the voyage again.